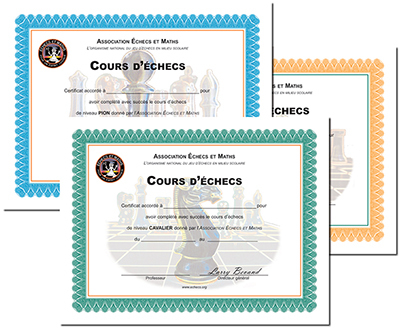 The Chess’n Math Association is dedicated to teaching chess to children. Our team of teachers, organizers and coordinators work in the community all year long to help the greatest number of children possible discover chess. Whether you want to retain the services of our teachers in your school or enroll your child in one of our many camps, we will be happy to answer any questions you may have. Founded in 1985, the Association has been teaching chess to children for 30 years. The best way to learn is with a playful approach. Learning and interacting as a group. Each student learns at their own pace. A long history of working together with children. Active in our community as well as in the chess community. Constant growth and development of players at all levels. Marius’ concentration has greatly improved since taking chess lessons after school. He likes Jeremie, his chess teacher, very much and I was even surprised recently to see him trying to teach chess to his little sister. Charlie’s chess game has improved a lot and he seems much more interested in math since attending day camp during the Easter holidays. Magalie and Jules adored their summer at chess camp and they’re very enthusiastic about their first time participating in a tournament this fall. With Chess'n Math, chess is easy! Our instructors teach chess at your school or club using a program especially designed for young people. It has been planned, built and tested by our best teachers over the years. This program consists of 8 levels – from Pawn to Advanced. As you can see, there’s something for everyone, even beginners! PAWN Square one: Basic rules & how the pieces move. QUEEN Strategy & tactics/those rated 750-900. KNIGHT Students learn check, checkmate and stalemate. KING Advanced strategy/tactics: for those rated 900-1000. BISHOP Basic tactics: Forks, pins, double-attacks, etc. INTERMEDIATE Positional play, etc./those rated 1000-1100. ROOK Fairly competent players/those rated 500-750. ADVANCED Advanced concepts/those rated 1200-1300. You'll be part of a small group where you have time to learn the lesson and ask your teacher any questions you want. Each lesson is followed by a practice period where you can play with your friends. Your teacher will use this time to help you with any problems you might have. You will be given exercise sheets at the end of your course so you can practice at home. Oh, and the "coolest", we’ll give you a beautiful certificate at the end of your session. Wow!! Learning chess has many benefits for children. Your child’s confidence will grow as they find solutions to problems and show that they can do well. Chess is also a remarkable tool for integration into our society; we learn to how to lose graciously (and also how to win). We also learn to respect our opponent, self-control and teamwork (school team competitions develop team spirit).